Cantaloupe melons, Cucumis melo are closely related to wild species in both Africa and Australia, however recent DNA work shows that like the cucumber, it most likely began domesticated life on the Indian sub-continent. Sow melon seeds one or two to a small pot or large module between February and May, in a propagator, heated greenhouse or on a window sill. The seeds need a temperature of about 20C to germinate. When the seedlings have emerged put them in a bright place but keep pretty warm. Melons won’t grow much in the polytunnel until nights warm up in May or even June. Dig bucket sized holes about 60cm apart where the plants will finally be planted out and fill them with well-rotted FYM, about half a bucket per plant. Then cover the FYM with soil and ground cover. Plant the plants through the ground cover, and water well. Protect from slugs. Melons need to have their flowers pollinated for the fruit to mature, usually insects do this for you but if you see the small fruit falling off, try hand pollinating them. Melons should ripen in September and October. They feel slightly soft at the blossom end when ready to eat. A very early maturing cantaloupe type melon. 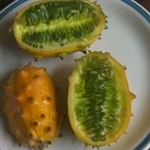 The fruits are small but delicious and can be grown in containers. In 2016 we grew 12 plants on a bed 2m x 4m, and got over 50 of these delicious small melons, which ripened from the end of August till the end of September. Sow in April and plant out in May/June, in a green house or polytunnel. They don't like drafts, and need a little bit of mollycoddling until they get going. When they are ripe one side goes a little yellow and there is some 'give' in the blossom end. Average seeds per packet 15.